C.S. 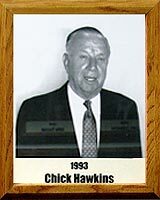 “Chick” Hawkins has devoted his life to helping others, especially the youth of Tucson and Pima County. Two of the most outstanding examples are his involvement with the Arizona Daily Star Sportsman’s Fund and his directorship of Triangle Y Camp. Chick has also served as director of South Branch Y, Lighthouse Branch Y and Jacobs Y Branch and as youth director for Lohse YMCA, His association with sports (beginning at Garfield High School in Terre Haute, Indiana, where he played basketball and baseball), has been long and distinguished. Chick has participated in YMCA volleyball, swimming and badminton and was active with the Learn-To-Swim campaign for many years. He served 22 years as track official finish judge at the University of Arizona and was associated with the football clinics at the U of A and YMCA for eight years. A respected YMCA swimming coach for many years, he has also been a finish judge for Special Olympics (swimming meets) and, for 35 years, supervised the Knot-Hole Club at U of A football games.